LIVE THE ISLAND LIFE! Boca Ciega Isle is one of the finest St Pete Beach Neighborhoods! 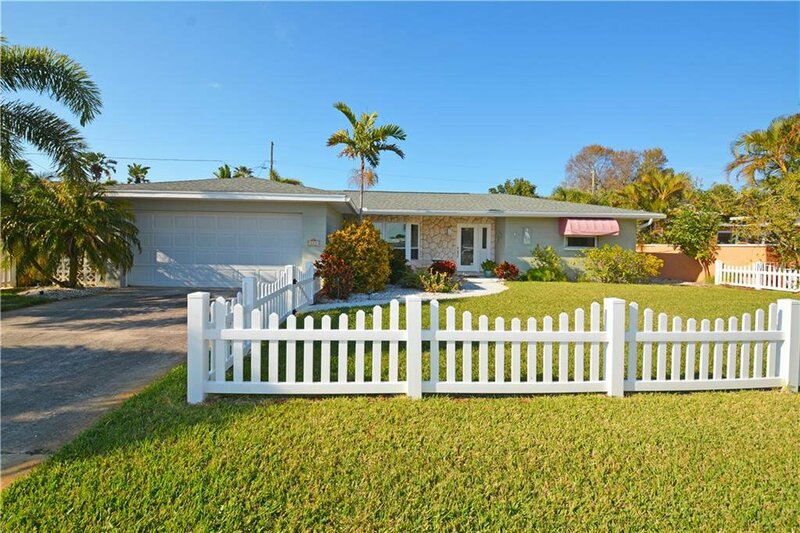 Immediately Feels like home as you drive up to the white picket fence! You will love this Move-In Ready 2 Bedroom 2 Bath Block home with an Open Floorplan. Light and bright with a beautiful front bay window that has a peek a boo view of Boca Ciega Bay! Bonus is a large enclosed Florida Room (253 sf not included) adorned with easy breezy windows and custom blinds! Large bedrooms with big closets. Open kitchen with an adjacent bonus "office space". Enjoy the Florida Lifestyle in the Private, large, fenced tropical backyard which is perfect for entertaining and your fur family! Oversized, attached 2 car garage has lots of storage and laundry. Additional features include a white vinyl fence (6ft), storm panels, newer windows, and water softener. This is the perfect St Pete Beach location! A short stroll to the Beach and Gulf of Mexico, many Restaurants and Pubs, Shopping, Parks, Banks and Publix! Minutes to Historic Pass-A-Grille, Ft DeSoto Park, I-275 and Vibrant Downtown St Pete! 30 minutes to Tampa International Airport. Living on an Island is true Paradise! Listing courtesy of RE/MAX PREFERRED. Selling Office: ENGEL & VOLKERS BELLEAIR.